Agriculture and climate experts have warned for some years now that rising temperatures and frequency of extreme climate events including heat waves experienced in many parts of the world will lead to a drop in major staple foods like maize and wheat. One cereal stands out in this looming climate chaos: pearl millet. Now, the decoding and sequencing of the pearl millet genome by a global team of 65 scientists from 30 research institutions has revealed critical coping strategies. The analysis of genetic variability among a thousand pearl millet lines has led to a better understanding of the ability of this dryland cereal to survive soaring temperatures (over 42 degrees Celsius) and its exceptional drought tolerance. This discovery, published in Nature Biotechnology on Sept 18, 2017, may also help develop climate adaptation strategies in other important cereal crops. 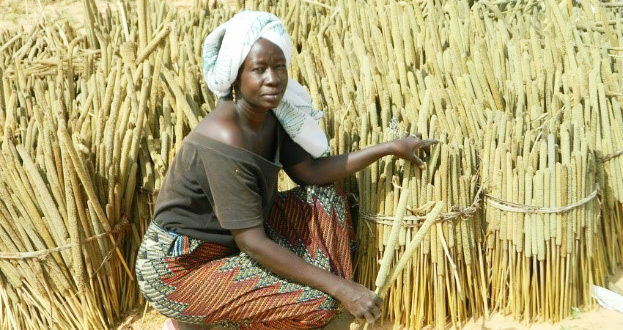 Pearl millet, a staple in the Sahel and semi-arid India, has the extraordinary capacity to resist baking heat. 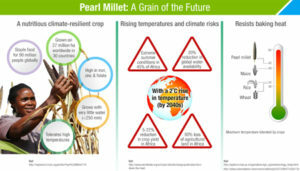 While most cereals like rice or maize cannot support temperatures over 30 to a maximum of 35 degrees Celsius when they start forming their grain, pearl millet will fill its grain in temperatures of up to 42 degrees Celsius. A global research team across ten countries (India, China, France, USA, Germany, Austria, Senegal, Niger, Italy and UK) used the latest innovations in DNA sequencing and analysis to identify new genetic tools like molecular markers related to drought and heat tolerance, as well as other important traits (better nutrition profile, pest resistance). With recent advances in big data and statistical genetics, this research will catalyze breeding efforts to improve this crucial staple food for the food security and resilience of millions of people in arid and semi-arid Africa and Asia in particular. Reliance on this climate resilient cereal by dryland populations goes back centuries. Archaeologists have even found that despite recurrent droughts, millet-eating farmers between the 11th and 15th centuries in Ghana did not starve as their popular staple was pearl millet. Pearl millet is a nutritious dryland cereal, rich in protein, fibre and essential micronutrients like iron, zinc and folate. Nutrition studies have shown it has the potential to fight iron deficiency, the most widespread micronutrient deficiency and major cause of anemia, affecting the health and development of a third of the global population. Pearl millet is grown on about 27 million hectares worldwide and is a daily food for more than 90 million people, among the most vulnerable in arid and semi-arid Africa and Asia. It is also an important source of fodder for millions of farms. However, the plant’s yields have remained low over the last six decades, as this cereal is mainly grown in poor soil conditions without irrigation, minimal and no fertilizer and other agricultural inputs. Investment in genetic research for this so-called “orphan” crop has been inadequate despite being the main food and feed for many farmers. As a result, breeders had limited genetic information to develop high-yielding superior varieties and hybrids that respond to farmers’ constraints. This new pearl millet genome research enables a better understanding of its genetic variability, and researchers have already identified candidate genes of very important traits, such as resistance to downy mildew, a very damaging millet disease, and heat tolerance. Such crop heat resistance will be crucial for farmers in many parts of the world as climate experts forecast further heat waves in years to come. With new biotechnology methods, we could foresee the transfer of these heat and drought tolerance traits to other important food cereals in the near future. Professor M S Swaminathan, father of the Indian Green Revolution, has been a strong advocate of nutritious pearl millet, which is now included in the food basket of the Indian public distribution system in some Indian states, including Karnataka. Unlocking the DNA data of this climate smart nutri-cereal will generate new pearl millet varieties to push the drive for more productive, nutrition-sensitive and resilient farming. This article was published in Thomson Reuters News Foundation. Domesticating crops for traits like higher yields is not without risks. Over time, domesticated varieties can lose other important traits that make them resilient to biotic and abiotic stresses. In a new study, scientists from ICRISAT report progress in transferring disease and stress resistance traits from wild relatives of several legumes to their domesticated varieties. On one hand, selecting specific desirable traits, such as high yields, can increase crop productivity. But other important traits, like resistance to pests, can be lost. That can make crops vulnerable to different stresses, such as diseases and pests, or the effects of climate change. To reduce these vulnerabilities, researchers often turn to the wild relatives of crops. These wild relatives continue to evolve in nature, often under adverse conditions. They possess several useful genes for desirable traits. These traits include high levels of resistance to diseases and tolerance to environmental stresses. Legumes, such as chickpea, pigeonpea, and groundnut, are among the few crops that grow well in the scant rainfall and marginal soils of the semi-arid tropics. But they are facing significant challenges, says Shivali Sharma, lead author. “Legume crops are hit hard by diseases, insect-pests, drought, heat stress, and salinity,” says Sharma. “Also, semi-arid regions are highly vulnerable to climate change.” These factors limit legume crops. There are several wild relatives of these crops that are resistant to pests and diseases. “There is an urgent need to find and introduce these useful genes from wild relatives into crop cultivars,” says Sharma. That would improve the resilience of domestic legume varieties and sustain agriculture in these regions. Researcher Sriniwas records data on groundnut crosses. Photo credit PS Rao. It can be highly challenging – and often impossible – to directly breed domesticated crops with their wild relatives. For example, of the eight wild annual species of chickpea, only one is readily crossable with cultivated chickpea and yields fertile offspring. Similarly, wild varieties of groundnut are resistant to fungal infections. But direct crossing of wild and domesticated groundnut is challenging because of differences in how the DNA in their cells is packaged. Additionally, these species do not cross well with cultivars. Most wild varieties of groundnut are diploid: their DNA is organized in two sets of chromosomes per cell, much like in humans. During reproduction, one set comes from the male parent and the other set from the female parent. Domesticated groundnut plants, on the other hand, are tetraploid. Their cells contain four sets of chromosomes. The sets of chromosomes in each cell, called ploidy, makes it difficult to directly interbreed wild and domestic varieties of groundnut. 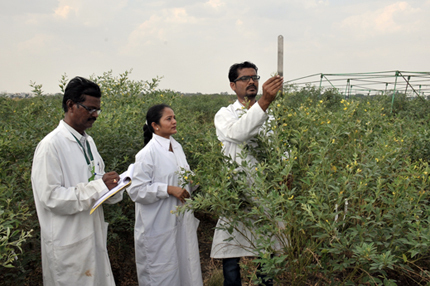 Researchers Milind (right) and Sathyanarayana (left), with Sharma, record data on plant height in pigeonpeas. Photo credit PS Rao. Pre-breeding programs, such as the one at ICRISAT, invest their time and skill in the wild crop relatives. Sharma and her colleagues bred wild groundnut varieties whose cells have four sets of chromosomes. Then they identified which of these tetraploid wild varieties were also resistant to fungal infections. These were then crossed with cultivated groundnut varieties to develop new breeding lines with good resistance and yields. Plant breeders can now directly cross these fungal-resistant lines with domesticated groundnut to create new varieties. It’s especially important in the context of legumes because they provide a bevy of benefits. For instance, bacteria in their root nodules pull in valuable atmospheric nitrogen. That increases soil fertility and reduces the need for fertilizers. Legumes are also vital for food security in the semi-arid tropics and other parts of the world. They are an important source of protein and micronutrients. Combined with cereals, they are a sustaining diet for people across the world. And “pre-breeding programs are the first step to improve the nutrition and resilience of modern legume varieties,” says Sharma. Read more about this research in Crop Science. Legumes are part of a food group known as pulses. The United Nations Food and Agriculture Organization declared 2016 the International Year of Pulses (IYP). In celebration, the Crop Science Society of America (CSSA) created a web page for the public about pulses, www.crops.org/iyp. Information provided includes K-12 Education, Beans in the News, Grown Your Own, and Delicious Ideas. Biotechnology covers a range of low to high-end technologies important for the prosperity and nutritional security of developing countries. However, public perception remains focused on genetically modified (GM) crops. Dr Rajeev K Varshney of ICRISAT highlights how scientists and policy makers need to focus on the benefits of these technologies for smallholder farmers and communicate better for effective adoption. Rain fed farmers represent over 57 percent of India’s cultivated area and support 40 percent of the Indian population. These farmers often lack advice about what crop to plant, and when to sow seeds. Groundnut farmer Bheemanna lives on few acres in the dryland region of Devanakonda, in Kurnool district, Andhra Pradesh State in India. 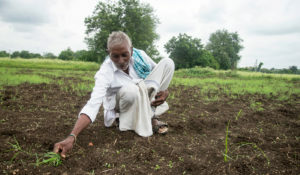 Every year, around June- July, Bheemanna like millions of other monsoon-dependent smallholder farmers, tries to assess when the best time to sow their groundnut seeds is and how much area they should sow. The onset of rains coming from Indian Ocean, overall rainfall quantity and recurrent dry spells vary a lot from one year to another in semi-arid tropical India. Rain fed farmers, who represent over 57 percent of India’s cultivated area and support 40 percent of the Indian population, often lack advice before the rainy season starts about what crop to plant, and when to sow seeds. With increasingly erratic monsoon patterns over the past years, farmers feel even more insecure. For them, weather forecast information is the most important information, after commodity prices, in planning their crops. But most often they don’t have reliable predictions. Some farmers would follow weather predictions from village elders interpreting signs like stars, wind or dragonfly behaviour, based on traditional astrological almanacs. The Indian Meteorological Department (IMD) does provide seasonal forecasts a few months before the rainy season but these forecasts cover huge areas and cannot be used on a local scale as farmers need. Such weather predictions can become a very sensitive issue as witnessed a few weeks ago in Maharashtra. Some farmers there blamed the meteorologists for misguiding them and threatened legal action. Back in April, IMD had predicted a normal rainfall so farmers had sown in early June following heavy pre-monsoon rains. But in some parts of Maharashtra the rains were followed by over three weeks of dry weather resulting in farmers fearing for this year’s harvest and their livelihoods. Scientists from the International Crops Research Institute for the Semi-Arid Tropics (ICRISAT) with the support of Microsoft and Indian weather institutes have developed real time farming decision tools that could lift a great part of climate risks for millions rainfed farmers in India. As part of the Andhra Pradesh Primary Sector Mission known as Rythu Kosam, a Sowing App helped Bheemanna during the 2016 cropping season decide when it was best to sow his groundnut seeds. He received a series of agro advisories by text in his local language throughout the cropping season. Using artificial intelligence and crop modelling tools, researchers could define for each village a moisture adequacy index through computation of local soil data, like the soil water retention capacity, historical and actual climate data and 5 days weather forecasts. Such index helps define the most suitable sowing date. Bheemanna was advised to wait a month before planting when most of his peers had already planted their seeds. He also received advice on land preparation, sowing depth and density, water conservation tillage techniques like broad bed and furrow and micro nutrient fertilisation. Bheemanna harvested 1.5 tons of groundnut per hectare, much higher than the meagre yields of his peers. 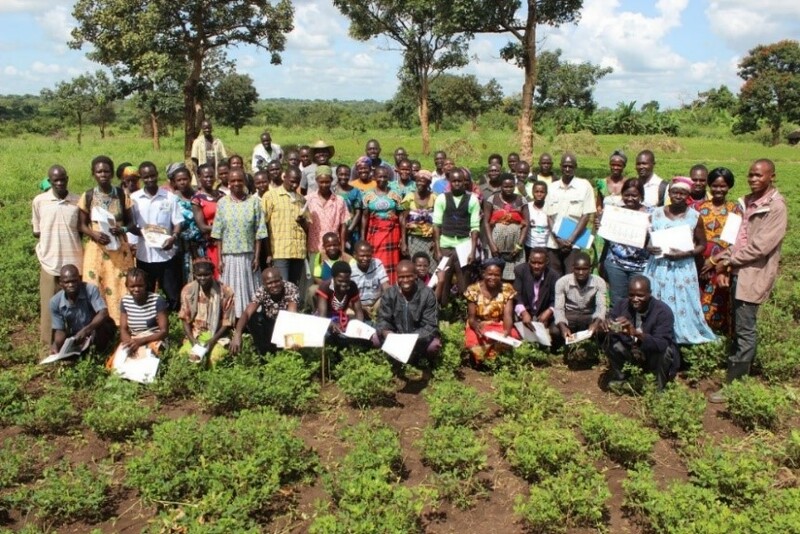 The 150 farmers involved in this pilot gained an average yield increase of 30 percent . This mobile application is now scaled up in 13 districts of Andhra Pradesh. Another approach explored by ICRISAT researchers is to build a decision tree using a mix of weather forecasts (seasonal, but also two-week and five-day forecasts) together with crop farming simulation to evaluate the different options farmers have in terms of crops, sowing time and farming practices to minimize climate risks. This Intelligent agricultural Systems Advisory Tool (ISAT), initiated through the CCAFS Climate Smart Village initiative, is now scaled up with support from Sehgal Foundation. After initial crop modelling validation and training, local extension agents and progressive farmers receive a whole range of cultivation advice text messages in local language, issued automatically every week, through the crop season. Rainfall predictions are updated every seven days thanks to a network of automatic weather stations as well as rain gauge readings by lead farmers in each pilot village. The type of text advice sent to the farmer is selected automatically depending on the weekly rainfall amount. This ISAT decision tool is based on four years testing with 450 farmers from semi-arid Anantapur district, which is a major area for groundnut farming in Andhra Pradesh. Here, farmers see 7 to 9 years out of ten as being very climate risky. 70 years of weather data show that when summer rains are below 300mm, this often leads to dry spells over 3-4 weeks during the period end June-August, which is very detrimental to the crops. Based on the seasonal climate forecast, farmers are advised to go for groundnut or shift from groundnut to more drought tolerant crops like sorghum or foxtail millet, after which they are advised on the optimal sowing date and management. Farmer Subbubu for instance shifted to blackgram from cotton cultivation based on the advisory which resulted in a 20 percent increase in yields.. After using this advisory service for three years and feeling the benefits, farmers are ready to pay for the mobile application. An exciting national development is India’s investment in weather forecast big data computing capacity. IMD is already able to scale down the rainfall predictions to district level and by next year, down to 330m grid range. With better rain predictions for each Indian village and the advances of machine learning, this sowing decision toolbox will provide even more tailored and timely crop advice, for each monsoon season, to eager drylands farmers. Bheemanna and Subbubu are ready to pay for this precious service as they saw its value in their own fields. Sixty five percent of irrigated croplands worldwide are dependent on wastewater, confirms a new study from IWMI and 86% of these are located in China, India, Pakistan, Mexico and Iran. With the high concentration of nutrients in wastewater, many farmers use it to curb expenditure on fertilisers. However, untreated wastewater carries pathogens and bacteria, posing serious health risks to consumers, especially when vegetables are eaten raw. Lack of access to clean water and unpredictable weather conditions are making things worse for farmers. Many are forced to depend on untreated wastewater for irrigation, to a much larger extent than previously thought. If adequately treated, domestic wastewater offers a sustainable solution to everyone in the food production and consumption chain. To help tackle this, ICRISAT, part of the CGIAR consortium, has established several village-level wastewater treatment units, known as constructed wetlands, in partnership with local governments and private companies to supply safe water for irrigation. With 87% removal efficiency for pathogens, these units reduce health risks and provide water security to farmers. Domestic wastewater continues to increase as the population grows and we must look at it not as waste but as an asset and source of value. If adequately treated, domestic wastewater offers a sustainable solution to everyone in the food production and consumption chain. Untreated and poorly managed domestic wastewater can contaminate irrigation and drinking water sources negatively impacting the most vulnerable. The decentralised wastewater treatment units consist of constructed wetlands with a filter bed of locally available sand/gravel and vegetated with specific wetland plants. This technology is an outcome of Water4Crops, a large Euro-India collaborative research project co-funded by the Government of India and the European Commission. Serigudam Sailu is a farmer from Telangana, India, with a mere half acre of fragmented land and without irrigation facilities. He depends entirely on rain to cultivate sorghum and pigeonpea to support his family. Without access to alternate water sources, conditions were difficult during low rainfall and long summer months. The treated wastewater is available free of cost. Until then, Serigudam had no choice but to accept erratic yields. “Three years ago, before using the treated wastewater, I was totally dependent on rain. If there was no proper rain, we suffered. As my wife and I eat what I grow, water availability means a lot to us,” he says. Now, with access to treated domestic wastewater all year, Serigudam has steady yields and is able to rotate crops, which has led to them diversifying their income. Safe wastewater recycling provides an additional reliable water source for irrigation, enhances crop yields for farmers and ensures safer food supply. “Many villagers warned me against consuming sorghum grown with village wastewater, but I use this treated water as I can see the benefits. Now after three years, others see I am healthy and improving my yields so they have stopped their warnings,” explains Serigudam. The Kothapally wastewater unit has the capacity to regenerate 20,000 litres of wastewater every day to grow crops on one hectare farmland throughout the year. Following Kothapally’s success, another treatment unit was established in the nearby village of Bhanur, thanks to a partnership with Asian Paints. Here, Sri Ramulu has also started using treated wastewater for his farm. Continuous supply of treated wastewater allows smallholder farmers to undertake crop rotation rather than keeping their lands fallow and provides fodder for livestock. Constant access to clean water has provided fodder for his six buffaloes and diversified his income and his family’s nutrition as well. This decentralised wastewater treatment system is now scaled out to 28 villages in Andhra Pradesh, Karnataka, Maharashtra, Telangana and Uttar Pradesh. With total treatment capacity of 863 m³ per day it can irrigate one hectare land at each village or provide water to nearly 3,000 rural households for domestic consumption. Witnessing the success of this solution the government of Telangana is looking to scale it across the state. Safe wastewater recycling should be encouraged to tackle the growing untreated wastewater use in agriculture. It provides an additional reliable water source for irrigation, enhances crop yields for farmers and ensures safer food supply. Chickpea is a lifeline food crop for India’s national food security. This protein-rich pulse is important for any Indian household’s diet, especially the poorest. This protein-rich pulse is important for any Indian household’s diet, especially the poorest. With an annual production of over 7 million tons, India accounts for about three-quarters of world’s chickpea production. Over the past 5-10 years, with rising temperatures and a shift of chickpea cultivation from cool Northern India to semi-arid central and southern states like Andhra Pradesh, farmers have witnessed the rise of a deadly soil-borne disease, dry root rot (DRR), which can wipe out all their crop. This soil-borne disease is caused by the fungus Rhizoctonia bataticola (Synm Macrophomina phaseolina), which thrives in crops exposed to soil moisture stress with temperatures over 30 C during the flowering to pod-filling stages. The plant dries suddenly and its leaves become straw colored. Dr Mamta Sharma checking chickpea DNA using LAMP. The problem is that several important diseases like Fusarium wilt have similar symptoms and DRR cannot be distinguished easily at the field level. At present, only laboratory methods are available to detect DRR with certainty: for instance, the commonly used polymerase chain reaction (PCR) techniques require specialized and expensive equipment. Farmers and agronomists feel helpless to assess the scope of this threat and design a proper pest management strategy. 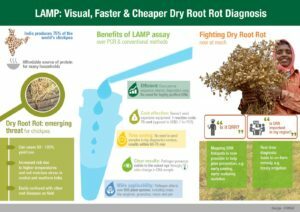 Plant health experts from the International Crops Research Institute for the Semi-Arid Tropics (ICRISAT) have developed a fast, visual and user-friendly plant disease diagnosis device that is ten times cheaper than existing PCR methods. This test can quickly identify an emerging root pathogen that affects chickpea and over 500 other crops globally, including nutritionally and commercially significant crops such as soybean, maize, sunflower, groundnut, pigeonpea, jute, and sorghum. 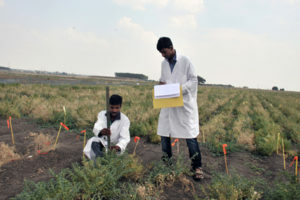 Published in Scientific Reports, (Nature Journal), ICRISAT’s research demonstrated 100% accurate identification of DRR in chickpea using Loop-Mediated Isothermal Amplification Method (LAMP). Used in biomedical research to detect the presence of parasite flatworms in human blood, this LAMP method has now been successfully adapted to correctly detect and indicate the presence of Rhizoctonia bataticola which causes DRR. This pathogen is soil borne and can remain in soil even after several crop cycles. 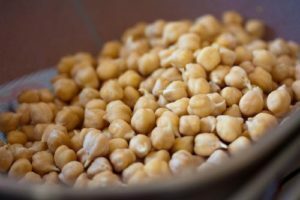 It is emerging as a major threat in central and southern India (major chickpea-growing regions), with disease incidence ranging from 5% up to half the area in badly affected regions. DRR can destroy all of a farmer’s crop in favorable conditions, but fungicide treatments are underdeveloped and expensive, making ‘on-farm management’ using timely irrigation techniques, early sowing times, and early maturing crops the only major remedies available to farmers. With the LAMP technique, infection can be detected with the naked eye. Once DNA is extracted from a suspected plant or soil sample, it is put into a small tube containing a specific enzyme mix and indicator reagent SYBR green or HNB. After being exposed to a temperature of 63°C for 60-75 minutes, the color of the mixture in the tube changes from yellow to orange or dark blue to sky blue only if the pathogen R. bataticola is present. The LAMP method is ten times cheaper than the lab test (70 cents per sample as opposed to a PCR reaction costing US$ 5-7). It does not require advanced skills unlike in existing methods, apart from DNA extraction. Highly sensitive, the test only needs a minimum DNA concentration of 10 fg, thus requiring little more than basic knowhow of DNA extraction. In addition, the reagents used are eco-friendly and non-mutagenic, making their use safe for both humans and livestock. Therefore, the LAMP technique can be used in remote places. ICRISAT scientists suggest developing portable LAMP toolkits for district-level farm extension centers, or Krishi Vigyan Kendras (KVKs), so that farmers can quickly access advice on proper pest management to combat DRR. And while the study was conducted mainly on DRR in chickpea, LAMP can be applied broadly for a large number of other important crops affected by this fungal pathogen. Adoption of this affordable user-friendly test by farmers and local extension workers may prove crucial to combat this rampant plant killer. Efforts to scale up the use of this test and develop easy-to-use toolkits, along with basic training for extension workers can help prevent crop losses and ensure food security for millions worldwide. The research was conducted under the CRP-Grain Legumes program at the International Crops Research Institute for the Semi-Arid Tropics (ICRISAT) by Mamta Sharma, Raju Ghosh and Avijit Tarafdar and funded by the Department of Science and Technology (DST)-Climate Change Division, Government of India, and the Science and Engineering Board (SERB), Government of India. The plant dries suddenly and its leaves become straw colored. In order to keep up with the challenges of ensuring nutrition for growing populations, the need for specific and reliable data to mitigate risks to agriculture from climate change, and to include smallholder farmers as stakeholders in the data revolution, the Department of Biotechnology (DBT), India recently launched ‘FarmerZone’. Envisaged as an intuitive and collective open-source cloud-based data platform for providing climate smart high-tech solutions to smallholder farmers, FarmerZone is targeted at improving the lives of farmers by catering to a variety of farming needs – from coping with climate change, weather predictions and soil, water and seed requirements, to market linkages to sell produce directly from the farm. 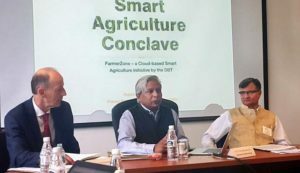 The DBT organized a Smart Agriculture Conclave between 29 August – 1 September 2017 in New Delhi to launch the platform and invite collaborations from leading international experts. At the conclave, experts from private, public and non-profit sectors along with farmers, brainstormed implementable solutions and discussed their potential role in designing and developing FarmerZone. The main aim of this platform is to design a model that can be scaled up and applied across a number of different agro-climatic zones. Dr Suhas Wani from ICRISAT highlighted the needs and challenges of smallholder farmers and explained how these can be overcome through specific and quality data. For example, soil analysis data is crucial for decision support tools and timely advice to farmers. Many smallholder farmers depend on rain for agriculture and they suffer when monsoon becomes erratic. 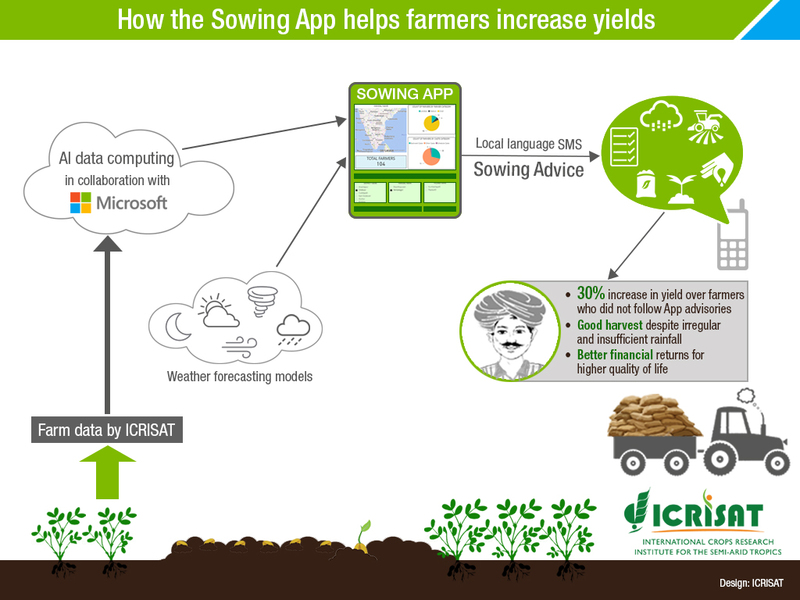 ICRISAT scientists have successfully implemented a sowing app which informs the best time to sow, in partnership with Microsoft. This cloud-based real-time sowing app has already supported 150 farmers in making climate smart decisions. Dr Vijay Raghavan, Secretary-DBT, elaborating the idea behind FarmerZone. 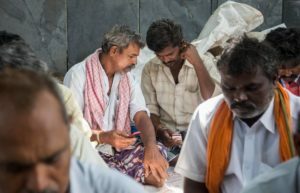 While many such initiatives exist discretely, or even as joint public-private initiatives like Krishidoot which leverages the power of ICT for enhancing agricultural productivity, the challenge of providing smart agriculture solutions to 46 million farming families need a more consolidated effort by various actors. The DBT also aims to establish sentinel sites and delivery systems using artificial intelligence and machine learning to facilitate the accuracy of solutions to address the needs of farmers in real time. The conclave was held in collaboration with the Research Council UK (RCUK) and the Biotechnology and Biological Sciences Research Council (BBSRC). You can read the summary of the conclave here. 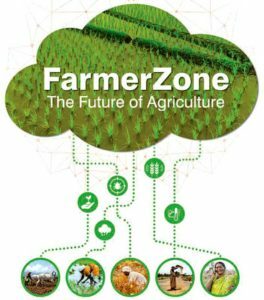 DBT’s FarmerZone will be an intuitive cloud-based platform that will collect, collate and curate field and remotely sensed data along with market intelligence to create smart agriculture solutions to smallholder farmers. A MarketZone will connect farm produce to viable markets. International partners to this initiative are – The US Department of Agriculture; FAO; IDRC; ICRISAT; GODAN; Penn State University; John Innes Center UK; Innovate UK; University of Reading; The Roslin Institute; Department of Business, Energy and Industrial Strategy (BEIS); and Aberystwyth University. These partners will collectively contribute knowledge and resources to the FarmerZone. Board Members with Senior Staff at the 82nd Governing Board Meeting at ICRISAT, India. Innovative ways of improving the livelihoods of dryland farm families in Africa and Asia through strategic investments in research was the theme of the Governing Board Meeting held on 25-27 September at ICRISAT-Patancheru. Issues discussed in depth included monitoring and evaluation, impact assessments and scaling up digital agriculture. Speaking on the occasion, Dr S Trilochan Mohapatra, Secretary (DARE) & Director General (ICAR) and Member of ICRISAT’s Governing Board remarked, “India witnessed an all-time production high in pulses in 2017.” While the production increase was partly due to the expansion of land under pulses, it was boosted by the adoption of high-yielding varieties and cultivars. “ICRISAT’s efforts are much appreciated in the realms of crop research and collaboration with government bodies. Integrating breeding strategies and new areas of genomics is an important issue worldwide and for India, and we must move faster in this direction,” he emphasized. While underlining the importance of South-South collaboration between national programs and ICRISAT engaging in Africa, he said there was greater scope to work together with ICAR to fill technology gaps. Dr Nigel Kirby, Chair of the Board, highlighted the importance of plant breeding. “It is important to relate genotypes that are in germplasm collections to phenotypes and mitigate risks to make plant breeding efficient and cost-effective, which at the end of the day should give enduring hope to smallholder farmers,” he said. Engaging in groundbreaking crop research to increase production and productivity is an extraordinary feat but it should be done with the consumer in focus. 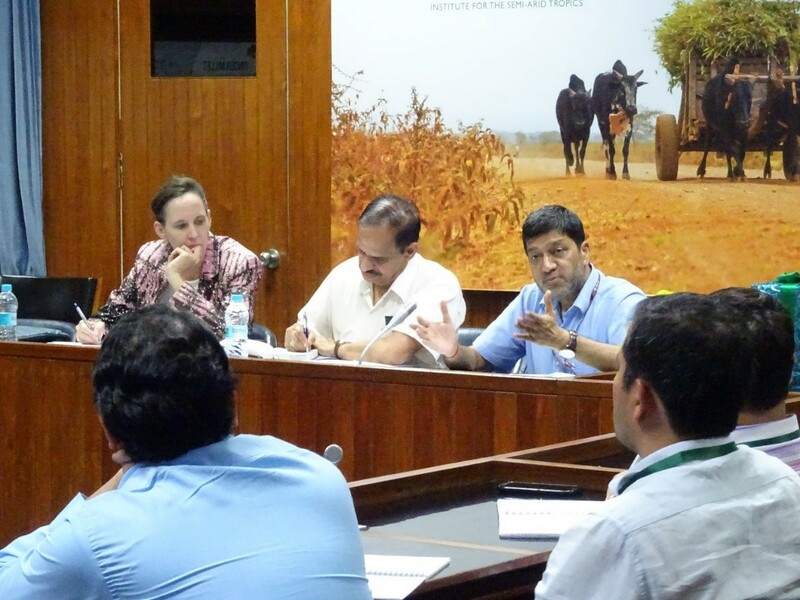 Research should be demand driven, and in this context, Dr Mohapatra suggested ICRISAT adopt a ‘value chain’ approach. 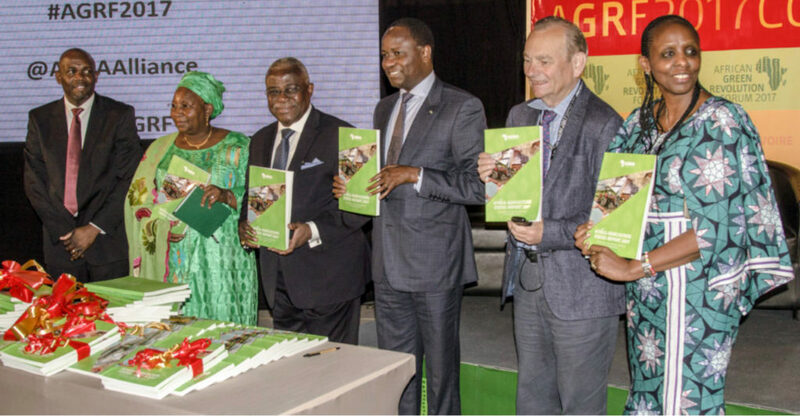 He recommended that ICRISAT take a long-term view on resource mobilization and look for support beyond 5-10 years. Dr Kirby welcomed the idea to initiate deeper deliberations on higher level resource mobilization. The Governing Board was pleased to hear the CGIAR Research Program on Grain Legumes and Dryland Cereals Agri-Food Systems is now ‘fundable’. While final approval is pending, the program is aimed at transforming underperforming agri-food systems in the drylands into well- functioning systems. Dr Peter Carberry, Deputy Director General-Research made a presentation on the proposal. 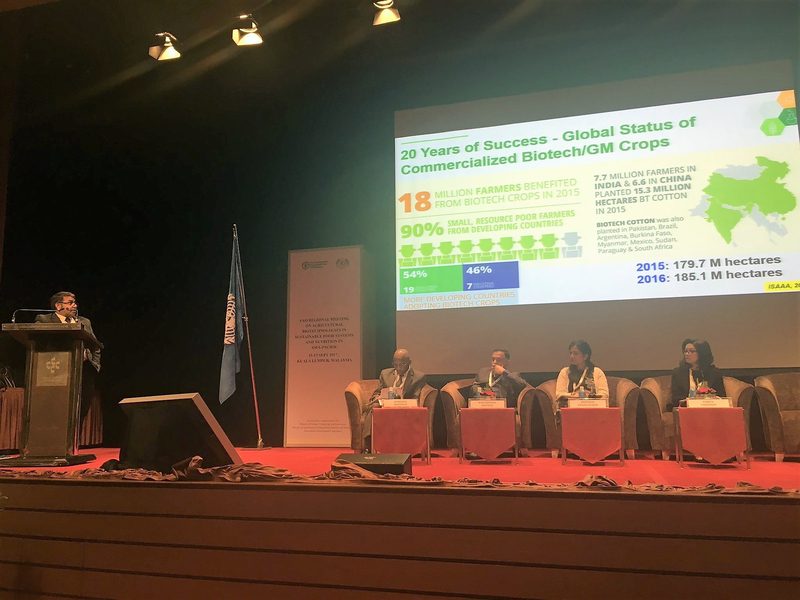 Dr Carberry also presented options to develop and fund strategic initiatives, including the issue of patenting for royalties from important ICRISAT innovations like the cytoplasmic male sterile gene in pigeonpea that could be used by the private seed sector. The Board appreciated this discussion, as scientists were asked for new ideas for Blue Sky Research or other initiatives with a focus on development. Research Program Directors Dr Ramadjita Tabo (West and Central Africa) and Dr Moses Siambi (Eastern and Southern Africa) explained how ICRISAT’s investment of $5 million from reserves as part of the Africa Strategic Fund was used to modernize its research facilities in sub-Saharan Africa. 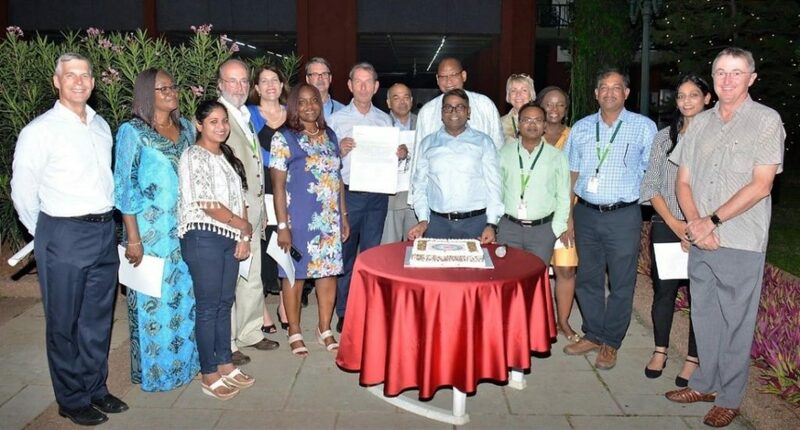 The Board appreciated the cost-effective improvements to provide modern facilities for ICRISAT staff and partners as well as supporting strategic staff positions to position ICRISAT for success. However, skill gaps still remain based on regional needs in the drylands that will be addressed through structuring regional programs, partnerships and building national capacity. 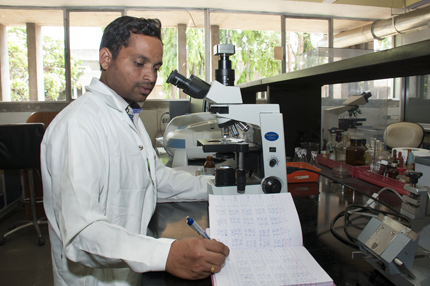 Future research needs like tackling emerging pests, digital agriculture, nutrition and latest genomics approaches should be promoted so that either through in-house or through new partnerships, ‘ICRISAT research programs stay at the forefront of science for development for the drylands’. 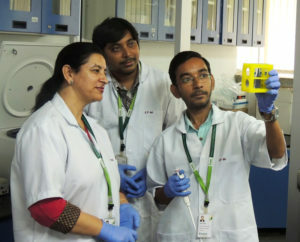 Three young ICRISAT scientists had the opportunity to showcase their groundbreaking ideas and research in climate change adaptation and modernization of crop breeding programs. Dr Dakshina Murthy Kadiyala, a systems modeling expert from the Innovation Systems for the Drylands research program explained how using location-specific rainfall data, his team created an Intelligent Sowing Advisory Tool (ISAT) piloted in the semi-arid Anantapur district, Andhra Pradesh in collaboration with Microsoft India. ISAT is a messaging tool for smallholder farmers to minimize climate risks and maximize yields and incomes. Farmers receive real-time, location, crop and soil-specific advisories using seasonal, medium range and two-week forecasts in their local language. ISAT is ready for scaling up with support from the Indian Ministry of Environment, with plans to transfer this technology to Africa as well. ISAT’s work would help shape climate-smart agriculture policies as mapping of climate risk exposure will provide strategic insights into, for example, where and when a shift from cotton and maize to millets and pulses would be much more beneficial. Dr Lekha Pazhamala, DST research grantee, has found a way to lower the cost of pigeonpea hybrid production by reducing the need from three to two hybrid lines. This was possible by finding which environmental factor controls the production of male sterile pigeonpea hybrid lines. Using the Leasyscan’s phenotyping analysis, Dr Pazhamala identified 24˚C day temperature as the threshold between fertility and sterility of pollen. Cytological studies expose the crucial stage of dissociation of tetrads which does not happen in sterile pollen. Transcriptome analysis showed that auxin, a phyto hormone known for its role in plant growth plays a key role as auxin production at a temperature above 24˚C cuts off sugar transport to the pollen, thereby starving it. Below 24˚C, auxin production would result in proper nutrient transport and dissociation of tetrads. The Board applauded this promising research as a perfect example of a fruitful ICRISAT investment in Blue Sky Research that will yield much more. Dr Srinivasan Samineni, chickpea breeder in the Asia program, explained a breeding strategy to develop early-maturing chickpea that can escape terminal drought. This is important because the pulse is often grown on residual soil moisture, for instance in rice fallows, way after rice harvest. Flowering time was reduced from 60 to 20-28 days as genomic regions controlling early flowering were mapped. Multi-parent advanced generation inter-cross (MAGIC) populations were screened for different traits including height, yield, and harvest index or seed size from 1,200 lines to 4 promising lines, which will be shared with ICRISAT’s national research partners. This result can be strategically exploited given the high demand for chickpea. Dr Samineni talked about the machine harvestable chickpea variety released in 2016 which has high demand by farmers due to increased profitability. Given that the process link between evidence and decision making is crucial for research organizations, findings from three ex-post impact assessment studies conducted in 2017 were presented by Kizito Mazvimavi, Country Representative – Zimbabwe. The UK Aid-funded impact study on the role of conservation agriculture in building drought resilience in Southern Africa and impacts from the Hybrid Parents Research Consortium on pearl millet in India were also mentioned. From November, under the Tropical Legumes III project, ICRISAT will use DNA tracers to assess the adoption rate of improved chickpea varieties in Ethiopia. Cloud, mobile and big data based system to improve monitoring & evaluation of development projects. Three promising case studies on how digital agriculture is transforming the drylands were discussed. Ram Kiran Dhulipala, Head – Digital Agriculture and Youth, presented ihub incubatees – Kalgudi (from Vasudhaika), the “LinkedIn” for agricultural communities; Khethinext (from PALS Global) helping farmers better access finance, markets, inputs and knowledge through an e-commerce network; and Plantix, a plant pest identification mobile App that provides highly accurate solutions to plant diseases and pests and the nearest agro-shops selling appropriate inputs to treat pests and disease. 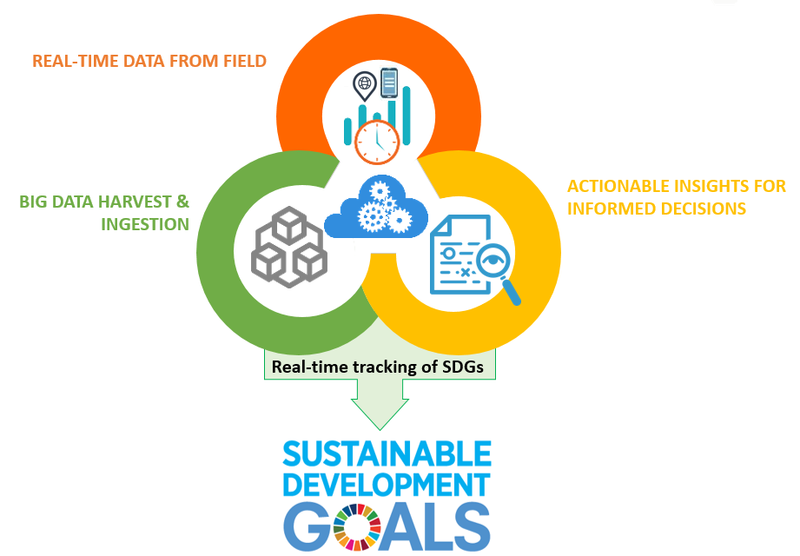 The importance of real-time monitoring and evaluation in assessing project results was highlighted in a presentation on ‘Modernizing M&E – Measuring for Big Impacts’, by Satish Nagaraji, Manager- Digital Agriculture (M&E and Tools). The Digital Agriculture team of ICRISAT, in partnership with ihub incubates, has designed and developed modern ICT-based monitoring and evaluation tools to collect quality data with real-time tracking, actionable insights for course correction and implementation. These systems use Android-based smartphone applications to capture and transmit crucial data, photographs and geotags. A web-based multi-layered dashboard will share evidence-based impacts among various stakeholders, including donors. The Governing Board approved the establishment of a Smart Food Endowment Fund. This will escalate ICRISAT’s Smart Food initiative to a higher level after it gained significant global traction and support. This initiative has been selected by LAUNCH Food as one of the winning innovations for 2017. Setting up the Endowment Fund is dependent on a business plan being developed and strategic partners will be sought to lead this initiative globally. The analysis of genetic variability among a thousand pearl millet lines has led to a better understanding of the ability of this dryland cereal to survive soaring temperatures (over 42oC) and its exceptional drought tolerance. This path breaking research was co-led by ICRISAT, BGI-Shenzhen, China and the French National Research Institute for Sustainable Development (IRD). Participants carrying the dissemination materials freely distributed by the NaSARRI team in Alero Nwoya District. Photos: Kyeyune Umar, NaSARR. 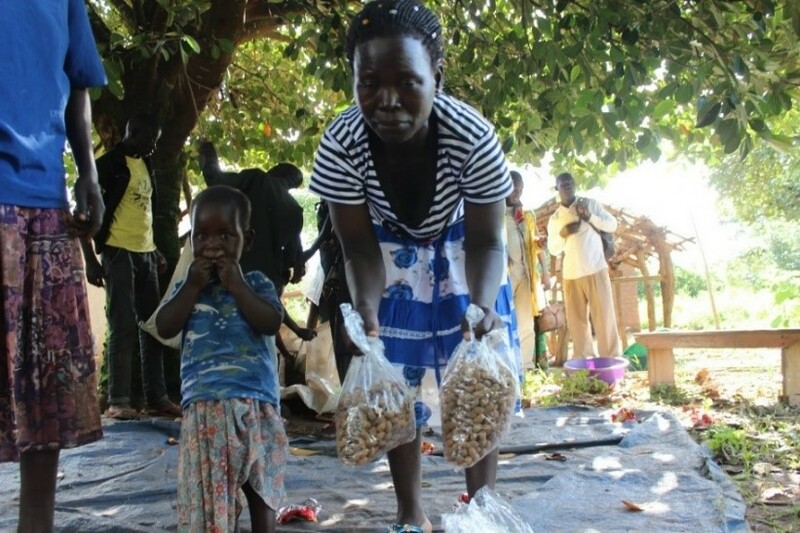 Mrs Leonora Okidi, a farmer of Pader district in Uganda is delighted with her harvest. She is part of a group of farmers who participated in two field days held in Pader and Alero Nwoya districts conducted on 15 and 17 August as part of the Tropical Legumes III project. 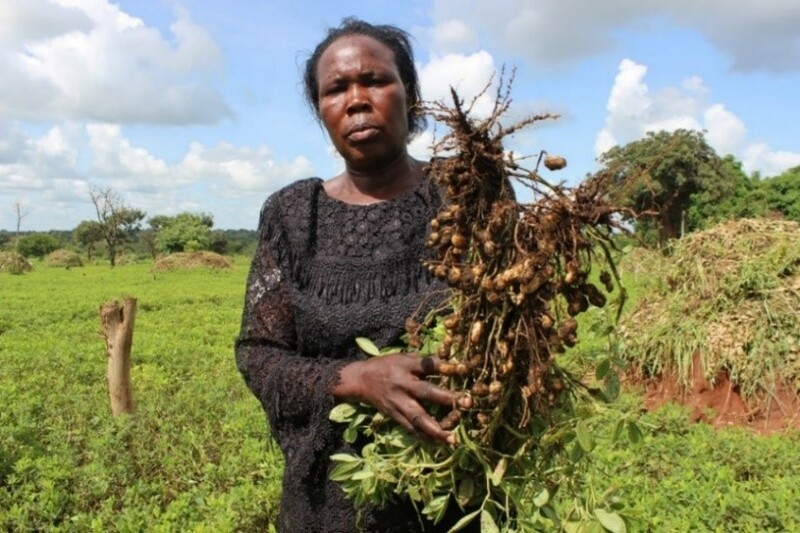 Leonora has been a beneficiary of using improved groundnut varieties Serenut 5R and 9. ‘’I divided my five acres of land between the improved varieties over 2 acres and local variety Red beauty over 3 acres. After the rosette virus wrecked the local variety I had planted, I abandoned it. The improved varieties were able to withstand the virus. I was impressed. Now my groundnut crop is able to feed and school my 11 biological children and support 25 other dependents,” she declares. Groundnut is an important legume in Uganda, and ranks second after beans as a source of dietary protein. 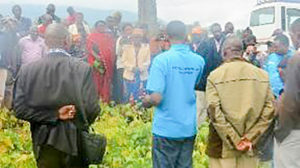 The two field days brought together different stakeholders along the crop’s value chain, including officials from the local government, agricultural and commercial officers, NGOs (including ZOA, Lutheran World Federation, World Vision, GGAO and Food for the Hungry), traditional and religious leaders, researchers from NaSARRI and NARO, and local media (Luo FM), in addition to farmers. 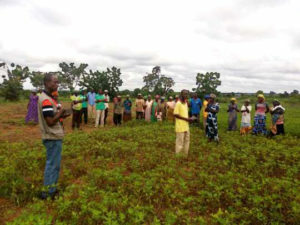 At Pader, three separate sites were chosen: (i) demonstration plots sown with Serenut 1-14 series: these were farmer participatory variety trial plots for groundnut lines undergoing National Performance Trials (NPTs) for wide adaptability, (ii) multiplication fields of Serenut 5R, 8R and 9T varieties, and (iii) a local farmers’ field cropped with both the improved varieties of Serenut 5R and 11T alongside Red beauty, a popular local cultivar. Meanwhile, three blocks of seed multiplication sites sown with Serenut 9T (Aber), Serenut 14R and Serenut 5R served as learning materials at Alero Nwoya. All varieties involved lines developed by ICRISAT and on each field, the crops were nearing physiological maturity. The field days allowed participants to exchange their experiences, discuss beneficial agronomic practices, and learn more about different seed varieties and sources. Farmers discussed the challenges posed by the groundnut rosette virus, which had caused severe damage amongst fields sown with landraces and seeds bought from local markets. 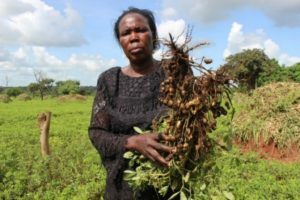 At Alero Nwoya, Mrs Adong Christine from the Mak mukemi group recounted how she had borrowed $7000 from the bank and planted 20 acres with local varieties of groundnut, but could only manage to harvest 2 bags (from potential 400 bags) due to crop damage. Visiting farmers bought small seed packs (0.5kg, 1kg, 2kg, 3kg) of improved varieties on spot, conveniently sized for immediate adoption. The crop’s near physiological maturity was timely as it helped farmers who had suffered damage on their crop of local varieties take hope; the event saw enhanced adoption of improved varieties to replace their damaged crop. Researchers from NaSAARI received requests from farmers to adopt their fields for research on improved varieties and as seed multipliers. Farmers sought the help of ZOA, the sponsoring NGO, for further training and frequent monitoring. 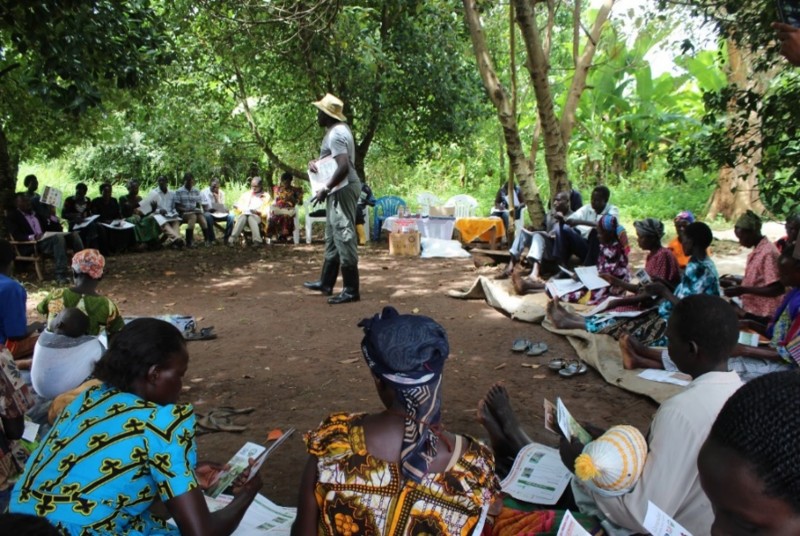 Dissemination materials detailing good agronomic practices, pre-and-post harvest requirements, and the sources and benefits of improved seed varieties were explained and distributed among participating farmers. 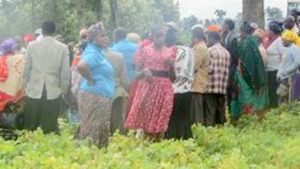 The Pader event, hosted by Green Globe Agriculturalists Organization (GGAO), was attended by 102 participants with 34 women farmers while the Alero Nwoya field day, organized by the Loyo Kwo Groundnut Seed Producers’ Group, attracted 61 participants drawn from 24 farmer groups, with nearly half the participants being women. A woman farmer carries small packs of the seed (1kg) as others continue buying in the background in Alero Nwoya District. Nearly 55% of India’s population depends on agriculture for their livelihoods. However, the share of agriculture in the GDP has declined over the last five decades, with widening income disparity between the agricultural and non-agricultural sectors. To address this disparity, the Committee on Doubling the Farmers Income was set up by the Department of Agriculture, Cooperation & Farmers Welfare, Government of India, in April 2016. Goats and cattle are crucial for the livelihoods of dryland smallholder farmers of Zimbabwe, in particular during hard times. Yet, livestock is not well kept. Goats are left to browse deteriorated rangelands, while cattle are traditionally fed on nutritionally deficient cereal residues. Recurrent crop shortages affect feed quantity and quality, especially during the dry season. This is insufficient to maintain animal health or to sell the livestock at the market for a good price. ICRISAT, ILRI, CIMMYT and Matopos Research Institute worked for 5 years with farming communities of Gwanda and Nkayi districts in Zimbabwe, under the ZimCLIFS project, funded by the Australian Center for International Agricultural Research, to introduce legume fodder crops like Mucuna as a solution for better livestock feed, and to improve market linkages for farmers to benefit from better livestock productivity. The approach used to identify pathways to improve smallholder food production and incomes, and facilitate farmers’ uptake of innovations was to set up agricultural innovation platforms (IPs). 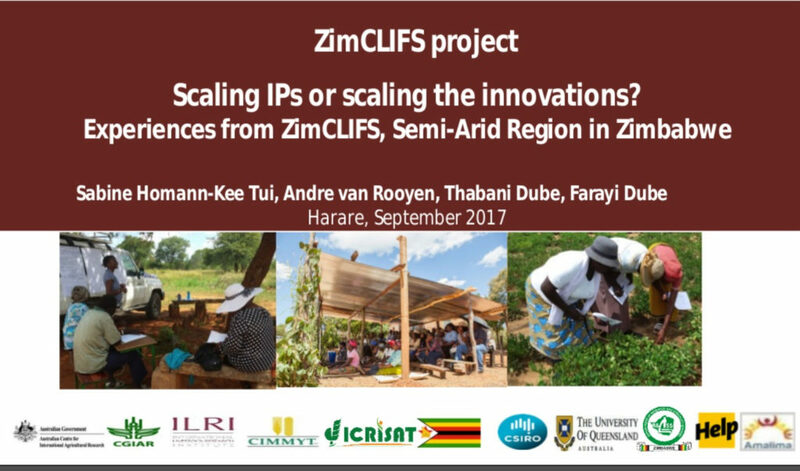 During the ZIMCLIFS closing workshop that took place on 18 and 19 September in Harare, researchers, government representatives, farmers and other major project stakeholders looked back at the lessons learned on how farmers take ownership of the innovation processes within IPs, and how initial successes of pilot innovation platforms could be scaled up and out. Through IPs, lead farmers were identified and trained on-farm on integration of crops and livestock, marketing and self-organization. Mucuna, a legume fodder, was chosen across the sites because it fitted seamlessly in their farming systems. 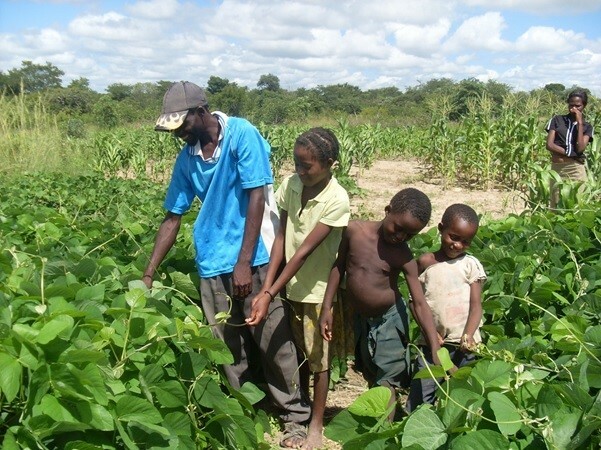 Farmers’ own field trials demonstrated that mucuna improves soil fertility when planted in rotation with cereals, and also reduces Striga infestation. As meat quality increased, goats fetched farmers better prices; goat value rose by about tenfold, from US$ 8 in 2006 to US$60-80 in 2015. Investing in IPs and combining a participatory farming system analysis with better market linkages can lead to positive change in the drylands and aid in future climate adaptation, and is definitely worth scaling up and out. 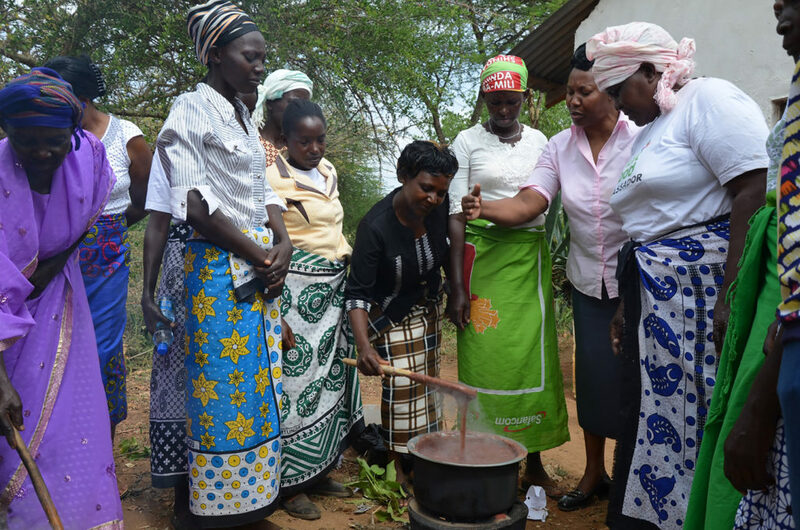 Ada’a Woreda’s women farmers who are training to be chickpea seed producers. Aiming to change the historically low representation of women in the chickpea and lentil value chains in Ethiopia, the Ethiopian Institute of Agricultural Research, along with ICRISAT* and ICARDA#, has devised strategies to encourage women to participate in the Chickpea Improvement Program at the Debre Zeit Agricultural Research Center (DZARC). 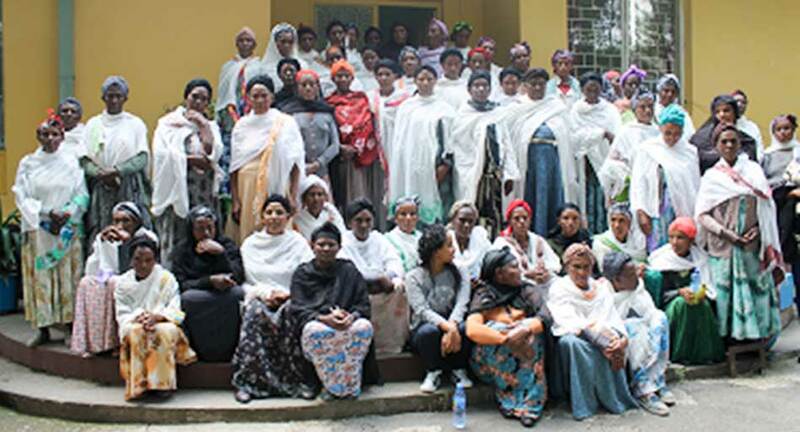 In Ada’a Woreda (Ethiopia’s largest chickpea-producing region), three Peasant Associations (PAs) were formed with 128 women (22 youth (<25 years of age) formed another PA). DZARC organized a training workshop for 95 women on the benefits of improved seeds, modern production practices, local and export market potential, technical support and more. Each participant was then given 30-35 kg of chickpea seeds as a revolving loan: each farmer would grow crops using the seeds along with help from District Bureaus of Agriculture and DZARC. Once harvested, they would share 30-35 kg of the harvested seed with other members of the PAs. Subsequently, five women members per PA would be selected to conduct farmers’ participatory variety selection (FPVS) trials on their farms, which would act as learning centers for other women evaluating and selecting varieties, based on their criteria and preferences for further testing on their own farms. The selected fields would be used to assess and monitor the women’s performance compared to plots owned by men in the same area as part of gender yield gap studies. Finally, the PA groups would be connected to seed quality laboratories for inspection and certification, so that the seeds could be marketed as certified seed. The ultimate goal is to empower women and youth to specialize in seed production, value addition and marketing of chickpeas. Data obtained by monitoring the gender indicators – knowledge, land and labor access, decision making, access to markets and benefits sharing – could be used to design more effective interventions. Visit to TL III groundnut trials at Gampela, Burkina Faso. Among the visitors were Dr Ramadjita Tabo, Regional and Research Program Director, ICRISAT West and Central Africa; Dr. Clarisse Barro, sorghum breeder; Dr. Roger Zangre, Pearl millet breeder and HOPE II National Coordinator; Dr. Korodjouma Ouattara; Dr. Amos Miningou, groundnut breeder and TL III National Coordinator; Dr. Chris Ojiewo, TL III Project Coordinator; Dr. Hamado Tapsoba, Hope II Project Coordinator. Improving genetic gain and strengthening the production and delivery of improved varieties of pearl millet, sorghum and groundnut were the focal points of discussion between partners of two projects – HOPE II (Harnessing Opportunities for Productivity Enhancement for sorghum and millets in sub-Saharan Africa, phase 2) and TL III (Tropical Legumes phase 3). The two project teams from ICRISAT visited the Institut de l’Environnement et des Recherches Agricoles (INERA-Burkina Faso) to discuss the achievements, challenges and adjustments required to meet farmers’ needs. They witnessed on-station evaluation of 100 genotypes of sorghum (from ICRISAT Kenya) at the INERA research station at Saria (80 km from Ouagadougou, Burkina Faso) as part of the HOPE II project. These new varieties are more resistant to stresses such as Striga, drought and anthracnose. 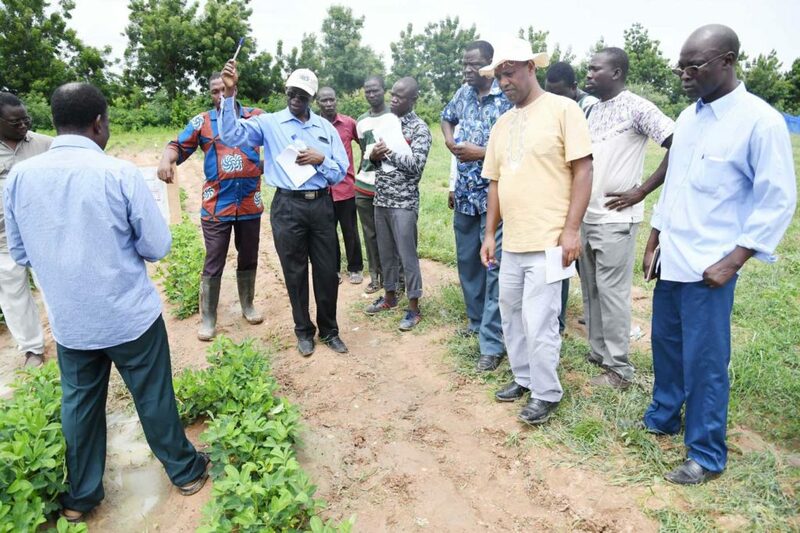 TL III activities contributed to improving the national breeding program in Burkina Faso for new groundnut varieties tolerant to foliar diseases, aflatoxin and drought. The project enabled Farmer Participatory Varietal Selection and community seed production by setting up three multi-stakeholder innovation platforms in major groundnut production areas. Training on Breeding Management System (BMS) strengthened trial design as well as data collection, management and analysis. New biotechnology tools in the sorghum and pearl millet breeding programs include the use of Marker-Assisted Selection (MAS) and germplasm genotyping for specific traits. Preliminary tests of yellow grain millet under Hope II aim to test performance of new high-yielding and nutritious yellow lines to meet farmer’ needs. In 2016, there were 42 women groundnut seed producers in Burkina Faso. In 2017, about 180 women are now producing community seed on at least 0.25 ha each. This number is expected to increase in the coming years. There are also more individual seed producers that are producing certified seeds. Dr Jeff Ehlers, Program Manager, Bill & Melinda Gates Foundation, urged both projects to realize the importance of data, stressing, “There is need to gather high-quality data, including data that will enhance our understanding of the trends, particularly on the gender dynamics”. Rotation plans between cereals and legumes as well as intercropping activities to be included. Crop rotation on both projects sites would help increase the quality of the soils. Higher investments needed for training young scientists and students as part of ensuring sustainability. Research should have measurable impact on smallholder livelihoods. Over 300 farmers attended a farmer’s field day in Northern Tanzania to learn about quality seed of improved common bean varieties, best agronomic practices and latest technologies which would help boost production, productivity, as well as improve the quality of beans produced. This was part of the Tropical Legumes III project led by ICRISAT to improve inputs and market opportunities for common bean farmers. How small seed packs are better aligned to the needs of smallholder farmers. The field day was organized at the Agriculture Seed Agency (ASA) seed farm at Ngaramtoni, Arusha, and was attended by 341 participants including seed companies, farmer groups (175 women, 129 men) extension agents and public organizations. Remarkably, there were more women than men present at the field day, presumably due to conscious efforts by the Tropical Legumes III project to include more women in their projects. Several new improved bean varieties such as Lyamungu 90, Lyamungu 85, Jesca, Njano Uyole and Uyole 96 were displayed to the farmers and other stakeholders. 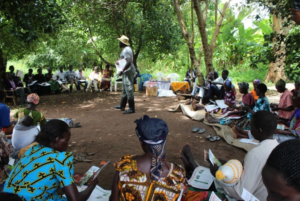 The field day served to inform common bean farmers about increased opportunities and possibilities in farming, including benefits of improved seeds, market value of processed foods, and advantages of shared knowledge in a networked value chain. 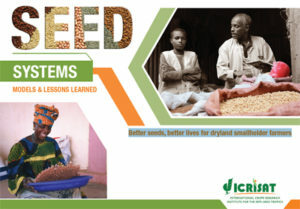 ICRISAT’s Seed Systems: Models and Lessons Learned booklet explains the rationale of ICRISAT’s work on seed systems in the drylands, the different approaches and their impact on the ground. Improving farmers’ access to improved seeds in the drylands is seen as a cost-effective strategy to improve farm productivity and food security. Different models of seed systems are tested and developed by ICRISAT and its development partners in sub-Saharan Africa and Asia depending on the local context. It includes small seed packets, groundnut seed revolving fund in Malawi, support to community-based systems, farmer seed organizations or local seed ventures, and public-private seed partnerships like the Hybrid Parents Research Consortium for pearl millet and sorghum in India. 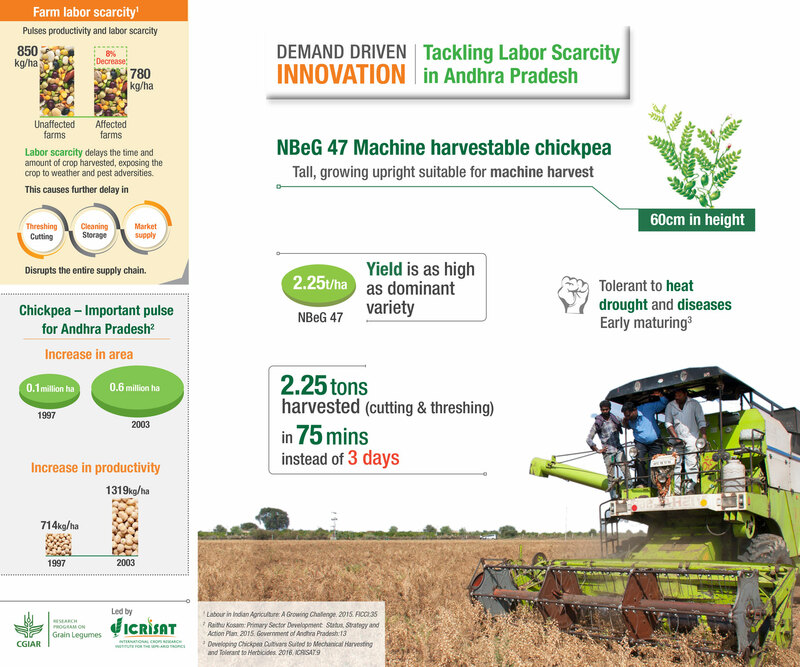 ICRISAT’s vision on seed systems is demand-driven, holistic and working in partnership, along the crop value chain.